Community food exchange fosters a resilient hyper-local foodshed. Many home gardeners find that they grow more produce than they can eat. Residents in Santa Barbara have found an alternative to using this surplus as mere composting material—they’ve decided to pool their suburban harvests to create a free community food exchange. In 2007, Owen Dell, a sustainable landscape architect and educator, created the Neighborhood Foodshed Project by getting friends and neighbors in his community together to swap excess produce from their yards. 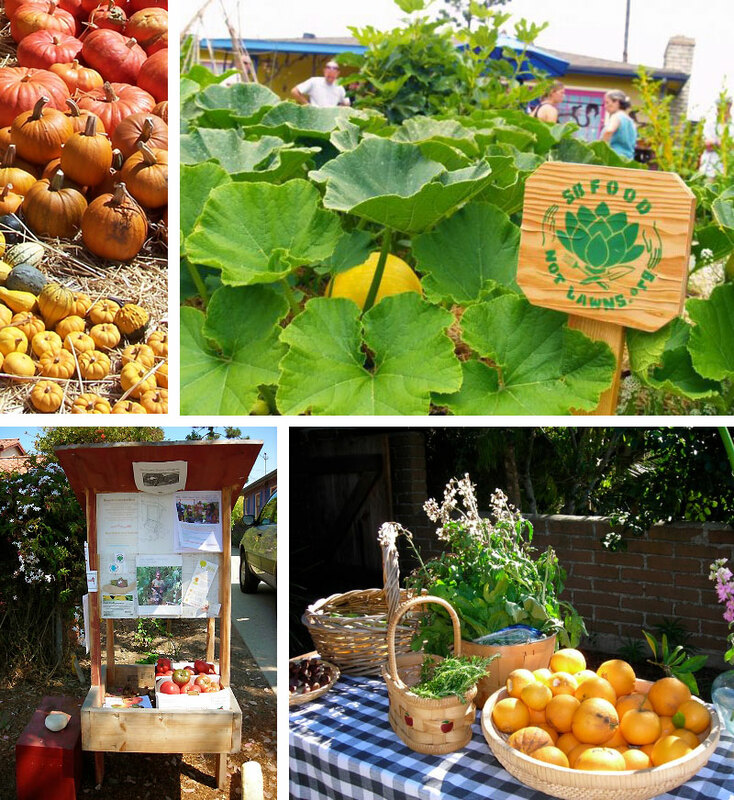 Inspired by this free food exchange, Lynn Siegel-Boettner and others brought the concept to their own neighborhoods, creating Santa Barbara Food Not Lawns, which has provided the inspiration for roughly 15 other neighborhood groups to create their own hyper-local foodsheds. These groups get together once a week to exchange a variety of produce, herbs, flowers, eggs, seeds, compost, honey, and much more. What started as a neighborhood exchange of surplus produce has expanded to other goods such as toys, recipes, cooking magazines, gardening and cooking advice—and even dishes prepared by neighbors which feature ingredients grown in the neighborhood. The exchange is open to everyone in the neighborhood, whether they grow food in a full scale garden, a planter box, or anyone who lives in the area—even if they don’t grow anything. Those who do not wish to garden or are too busy to do so are encouraged to either plant a crop that requires very little input, such as an orange tree, or to offer their growing space to other gardeners in the neighborhood to cultivate. Each week the exchange takes place in a different neighbor’s garden, allowing community members to gather and swap gardening advice while touring the garden to observe different planting techniques. This exchange has grown beyond simply providing access to fresh, free produce—it has proven to be a successful way of connecting with neighbors to build an engaged and resilient community. “All of the sudden, these houses that you walk by that are essentially filled with anonymous people are meaningful to you. You know the names of the people; you know what they are growing, and you’ve eaten the food they’ve grown in their yard,” said Owen. You can read our interview with Owen Dell here. An architect and neighbor in the Mesa food exchange in Santa Barbara built a specialized curbside kiosk to encourage open communal sharing. The kiosk can be made from any number of recycled materials and can either be set up regularly on a curbside or in a garden on the day of the exchange as a place for people to deposit surplus produce, seeds, books, toys. It can also accommodate a community board to post dates of food exchanges, a scheduling chart of what kind of produce grows well in the area in different seasons, and any other relevant neighborhood information. The Santa Barbara Food Not Lawns website offers a few steps for individuals who are interested in starting a food exchange in their own neighborhood, beginning with introducing neighbors to the concept of a free, communal food exchange. It suggests identifying which neighbors grow produce in their yard, or have space to do so, as well as a few smart ways to approach them and others in your community by passing out flyers to advertise a food exchange—such as leaving the flyer on their doorstep under an apple or other piece of surplus produce you may have from your yard. The website even supplies a sample flyer that you can use. Hosting the exchange is fairly simple, requiring a space such as garden or drive way, a few chairs, and a table to display the produce. Santa Barbara Food Not Lawns suggests swapping hosting duties around the neighborhood to involve more of the community, as well as to display each others’ growing spaces.